we had an exciting beginning to this first week of the new year…a glorious adventure to the emergency room! actually, it wasn't glorious, but it was an adventure. one that i'm sure i don't want to repeat (but probably will). monday afternoon, after sam's diaper change, he was (as usual) playing "run! run! ", which means he was running around like his nutty self waiting for me to come and catch him. he was in our room when i caught him (but didn't scoop him up—and i'm regretting that i didn't) when he tumbled over his own feet and banged his head against the metal handle on mike's dresser. at first i assumed it was another bonk on the head (one of many), and i went to scoop him up and try to kiss it better, when i noticed it was bleeding. and (as i learned later) headwounds know a few things about bleeding. blood was everywhere. so i ran into the bathroom, trying to minimize blood on me and him and everything that isn't easily wiped with a damp cloth, and had him lean over the bathtub while i wrestled with him to let me stop the bleeding. i thought i did pretty well (under the circumstances) of keeping cool as i cleaned him up and got him calmed down. he was calm (or at least not crying) within a few minutes, and i was able to stop the bleeding and get a bandaid on his head so that i could get the rest of him cleaned up. as i mentioned earlier, headwounds know how to bleed, and there was blood all over his hands (i think this was part of what scared him so badly) and blood on his shirts (and the floor and on me and puddled in the bathtub…) we changed his shirts (which i put into the sink to soak), and took him down so i could call the pediatrician. we got a call into the doctor and he said that if the skin was not touching (it wasn't), that we should go to the emergency room. this was about 4:10 or so, and i knew mike would be home sooner than we would, so i called him at his office to let him know what happened and where we were going. sam was quite calm through all of this, but i was struggling to keep him busy so that i could get him out the door, so we put mike on the speakerphone (sam was very excited about being able to hold the phone and talk to daddy), got out the door, and drove to the ER–with mike on the phone with us the whole way. at this point, let me just say that i love my new phone more than ever. at the ER sam was most interested in the bed that was shaped like a truck with steps and the fancy toy that was in the waiting area (that he didn't get to play with because i was more worried about the gaping hole in his head more than having a good time). we got to sit in a very "fancy bed" and he got to work the remote for his own personal tv while we waited for the doctors to come check him out. 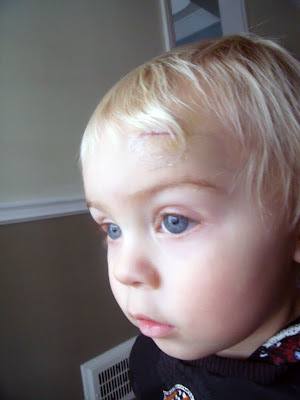 we were glad to find out that he wouldn't require stitches—just glue. mike showed up soon after sam got checked, and sam was greatly relieved to see him (as was i). holding sam down to get glued was very traumatic for all of us (this was the point where i really lost my cool), but sam perked right up when he realized that he was being handed a yummy popsicle and there would be no more messing with his sore head. by bedtime, he was back to his normal self. i am still paranoid every time he takes off running. the photo is from two days after the incident. if you didn't know about what had happened, you'd barely notice that sam's head has been glued back together. luckily he's not humpty dumpty. note: i just wanted to say that it's clear that sam's head is still working quite well. yesterday i heard him counting to himself and he was able to get up to nine all on his own! not too bad for a 23 month old.